715 S. 46th Ave., Hollywood. 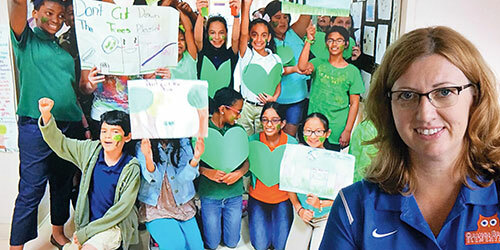 TEACHER: Monika Moorman, fifth-grade gifted, high-achieving students. Moorman: I believe my students embraced my eco-friendly lifestyle. I hope I instilled in them a lifetime passion for environmental concerns by participating in local events such as a beach cleanup or sprucing up our school garden beds during afterschool hours. I am always on the lookout for topics that they relate to at a local level. I shared the news of the possible tree removal, and my students took it from there. All of my 20 wonderful students wrote moving essays. Some created posters and designed ‘Save the Trees’ buttons. Some wrote a speech and created a chant for the peaceful protest. Others created and recorded video invitations for local dignitaries to join the event. It was an amazing team effort. O’Neal: I was truly moved by my students’ dedication, their passionate letters, their peaceful organized protest. I felt the only logical thing to do was to allow them to vote. Moorman: My students had a unique firsthand experience of the power of participation and voting. They saw that even 10-year-olds have the ability to change the world. O’Neal: Our students need to understand at an early age that their voices matter, and if they are organized and committed to an important cause, they can ultimately make a difference no matter what society tells them. Moorman: Seeing the ‘Save the Trees’ experience develop from a classroom dialogue to a school-wide referendum involving the county elections office, Superintendent [Robert] Runcie and Hollywood officials was an empowering endeavor for me and my students. O’Neal: The trees will be saved [final vote: 276-67] and we will find an alternative location for our electronic marquee.